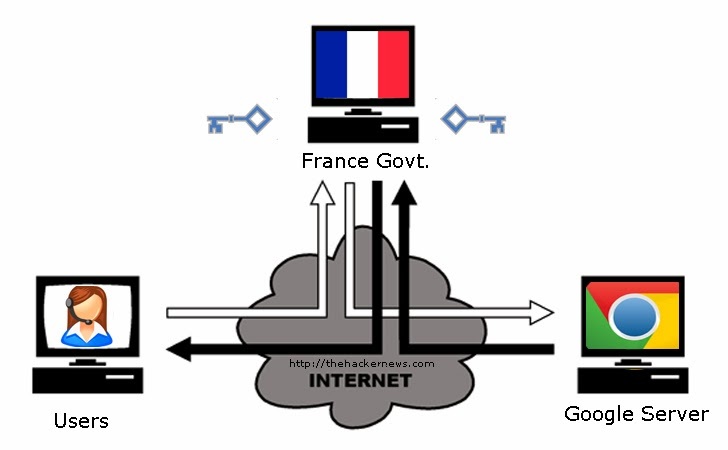 Google has found that the French government agency using unauthorized digital certificates for some of its own domains to perform man-in-the-middle attacks on a private network. Google security engineer Adam Langley described the incident as a "Serious Security breach", which was discovered in early December. Rogue digital certificates that had been issued by French certificate authority ANSSI, who closely work with the French Defense agency. Google has immediately blocked the misused intermediate certificate and updated Chrome’s certificate revocation list to block all dodgy certificates issued by the French authority. In a statement, ANSSI said that the intermediate CA certificate was used to inspect encrypted traffic with the user's knowledge on a private network with a commercial device i.e. Snooping on its own users’ Internet usage. According to the, the inspection of SSL traffic on their own networks can help organizations prevent data leaks or discover malicious connections initiated by malware. It could be a critical threat if one such signed certificate was ever fall into the wrong hands. Microsoft warned that, "An attacker could use these certificates to spoof content, perform phishing attacks, or perform man-in-the-middle attacks against a large number of Google-owned domains, including google.com and youtube.com." Last year, a Turkish certificate authority called 'Turktrust' was revealed to have issued two subordinate certificates for the domain gmail.com, and that these certificates had been used to intercept Gmail users’ traffic. NSA is also alleged to have used man-in-the-middle attacks through unauthorized certificates against Google in the past. Google said, "We're now working to bring this extra protection to more users who are not signed in."